Yokogawa Australia has supplied its breakthrough HXS10 solar controller to NEP Solar—one of the pioneers of solar energy in Australia—for use in a solar cooling project. 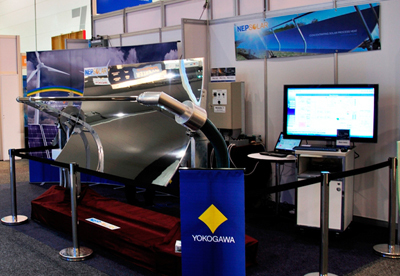 NEP Solar of Warriewood on Sydney NSW grew out of companies that were involved in wind farm development, but later became a pioneer of novel solar applications such as the first solar cooling project in Australia in 2004. 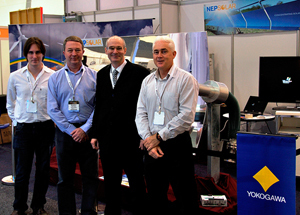 NEP Solar's local projects to date include a solar cooling demonstration project under the Renewable Energy Development Initiative (REDI) at the Commonwealth Scientific and Industrial Research Organization (CSIRO) Energy Centre in Newcastle, and a solar cooling demonstration project funded under New South Wales Government's Sustainable Energy. Research Development Fund (SERDF) in Padstow, partly funded under the New South Wales government's SERDF. One of NEP Solar's latest projects is a commercial installation of a solar field to drive a chiller for part of the GPT Charleston Square shopping complex in the regional city of Newcastle north of Sydney. The 345 m2 "PolyTrough 1200" solar field is mounted on a rooftop above a cinema complex. 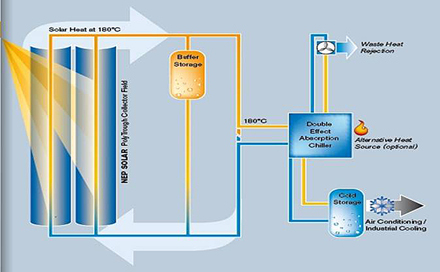 The chiller uses the heat from the solar field and a concentrated salt solution in which water gets absorbed and re-absorbed, exchanging heat in the process. The chilled water from the absorption chiller feeds into the shopping center's return cooling loop to reduce the amount of energy expended to further cool the water for the center's air conditioning system. The critical part of the efficiency of the concentrated solar system is the ability to very accurately track the sun and adjust the angle of the reflectors on two axes to capture the maximum incident solar rays. When NEP Solar became aware of the advantages of Yokogawa's new HXS10 solar controller and the FAST/TOOLS SCADA system, it could see the advantages of using the solar controller to replace common PLCs in future projects. The HXS10 is capable of accurately positioning the troughs in line with the sun, and the FAST/TOOLS software provides detailed performance and status information on the solar field to maximize output. FAST/TOOLS can even tell an operator that there is too much dust on the troughs (important as dust diminishes output). NEP Solar's solar collector utilizes a specially coated aluminum mirror, which is mechanically polished to an extremely reflective finish – as high as 92% – rivaling the highest quality heat-sag glass mirrors. The lightweight, composite sandwich construction mirror panels and tracking system are robust to maintain tracking and focus for optimum conversion efficiency. They are also strong and can withstand winds up to 108 km/h in the "parked" position. 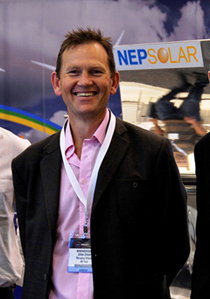 NEP Solar's Chief Executive Officer, Johan Dreyer, an engineer with experience as a project manager for one of Australian's largest commercial and industrial construction companies, said, "It is very important to control costs and ensure reliability for solar energy to achieve its potential in Australia. The critical part of the solar system is the ability to accurately track the sun. We need to focus exactly on one point (the solar tube), and the tracking needs to be very accurate. 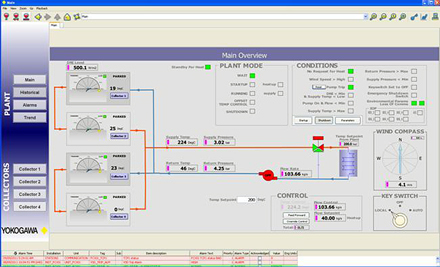 Yokogawa's HXS10 solar controller makes this possible." Mr. Dreyer went on to say, "The efficiency of the mirrors is such that the system can capture enough solar energy to cool even on a partly cloudy day. In full sun, direct normal insolation using this type of system can be as high as 1000 watts per square meter." Flow meters and temperature sensors such as those produced by Yokogawa can determine how much energy is being converted into thermal energy to monitor the efficiency of the entire system. NEP Solar will next use the Yokogawa HXS10 and the related FAST/TOOLS on a desalination project in Spain and at a dairy processing plant in Switzerland.